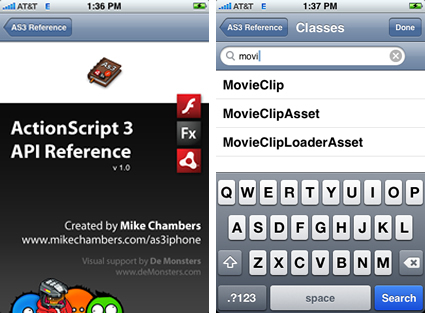 Mike Chambers from Adobe just released a new iPhone app for viewing the ActionScript 3 documentation. The app includes class references for Adobe AIR 1.5, Adobe Flex 3.2 and Flash Player 10. I've been testing it this weekend and it has run great. There is more information on Mike's website for the app, including a download link for the iTunes App Store. If you want to install the app directly on your phone, you'll need to search for "Mike Chambers" to find the app while it works its way into the App Store search. The long awaited release of Gaia 3.0 is available for download now! There are lots of great new features and bug fixes included in 3.0, the biggest of which is Flash CS4 support. The Gaia panel was completely rewritten in Flex and includes optimization features, easier Gaia project management, and a new publish panel which makes developing with Gaia even easier. Gaia 3 also features a brand new version of SWFAddress (version 2.3) that fixes the Firefox 3 OSX redraw bug. 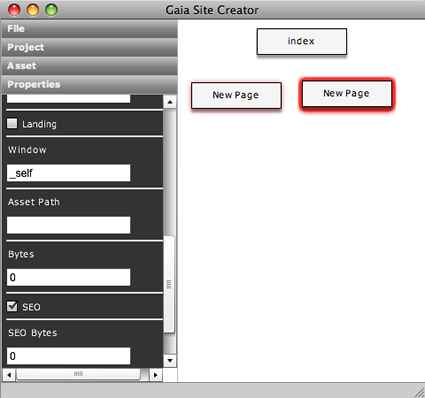 There is also a completely new addition to the Gaia project: the Gaia Framework Site Creator AIR application. This small AIR application allows you to quickly update your project's site.xml and visualize it as a wireframe sitemap. Some of the features include XML validation, drag and drop re-ordering, reordering of asset load order, editing project properties, and printing a site map. You can download the first version from Wade Arnold's blog posting about the app. It is with huge regret that we have taken the decision to cancel FOTB Miami. Our intention was to bring FOTB with its awesome speaker line up, fantastic networking opportunities and of course terrific FOTB vibe to the USA, but low registration numbers have meant that we would not be able to deliver the high calibre event that Flash on the Beach has become well known for. Looks like even conferences are having problems with the down economy, which in reality, makes sense. I was excited about the conference coming to the States, so I am obviously disappointed to hear the news. One thing did pick up my spirits a bit, however: John Davey decided to not only refund everyone's registration fees, but also provided a free pass to FOTB Brighton 2009. Looks like I will be going to Brighton this year, after all! For the next 48 hours you can get a full three day conference pass for Flash On The Beach Miami for only $99 (as opposed to the regular cost of $359)! When you purchase your ticket use promo code RSKNUTS1 and you'll get the discounted price. I bought my tickets at the "super early bird" discounted price and paid more than this - so $99 is truly a great deal. Note that this promotion only lasts 48 hours and is ending at midnight PST on Wednesday 14th January.